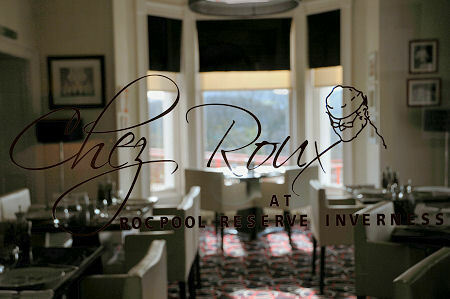 Rocpool Reserve is home to what was Scotland's first Chez Roux Restaurant. There have been others since, and all are very good indeed, but the Chez Roux concept seems to us to particularly suit a chic city hotel like this one. The philosophy behind Chez Roux is best stated by Albert Roux himself: "I want to recreate the kind of restaurant I remember from my home town, offering good and honest country cooking. The kind of place you can go to eat without ringing the bank for permission... Chez Roux will offer Scottish ingredients with a French twist." You can read our hotel review for Rocpool Reserve here. Those wishing to dine at Rocpool Reserve have a number of options available to them. A room service menu of "Light Bites" is available from lunch until late evening. This doubles up as the bar menu, which is available during the same period in the R Bar. The menu features options such as soup, sandwiches, salmon pate, Caesar salad (with or without chicken): or tea and scones for those looking for an afternoon tea. Anyone eating lunch against the clock can select from "RouXpress", a menu offering a soup, a choice of three mains and a sweet, all of which are served together to ensure you can spend the maximum time enjoying your food and as little as possible waiting for it. For those with the time to really enjoy their food, Rocpool Reserve also serves both lunch and dinner in the Chez Roux Restaurant. Here diners can select from either an a la carte or a fixed price menu, both of which change fortnightly, or a separate vegetarian menu. When we visited the a la carte menu offered five starters, five mains and five desserts plus the cheese board, while the fixed price menu offered a choice of three of each. We selected from the a la carte menu and the dining experience started with drinks and delicious canapes in the bar. We then moved through to the dining room, which offers superb views over Inverness to the hills beyond in very stylish surroundings: with, in summer, the option of al fresco dining on an outside terrace. The starter of "soufflé suissesse" was absolutely magnificent, while the tian of crab was also exceptionally good. A main of "pure Angus pedigree rib eye steak with fresh chipped potatoes and béarnaise sauce" and another of "seared pollock fillet with a shellfish chowder" also had us raiding the superlative locker. The desserts were also excellent, with perhaps the highlight of the whole meal being "Albert Rouxs classic glazed lemon tart with raspberry sauce": a dish we later learned had been the result of extensive experimentation in the kitchen to get the pastry absolutely perfect. It was. Dinner was rounded off with coffee and petits fours in the bar, the latter being a delicious and suitably light "Scotch chocolate crunch". It is sometimes the little things which make all the difference to a dining experience. Staff were keen to ensure that water glasses were always replenished during the meal: while the way the cheese board was shown to guests selecting dessert, with an offer of an explanation of what was on it, was a very nice touch. Breakfast is served in the restaurant and both courses are table served. The freshly squeezed fruit juices really were freshly squeezed, and the "plate of fresh fruit" was excellent. Options for the cooked course ranged from Isle of Skye kippers and an omelette Arnold Bennett to the full Scottish breakfast, which turned out to be freshly prepared and very good indeed. You can read our hotel review for Rocpool Reserve here.